Eight years ago, Somali cartoonist and journalist Abduallahi Muhiaddin, who uses the pen name Abdul Arts, was forced to flee his home country under threat from militant group Al-Shabaab, which did not appreciate how it was depicted in his cartoons. 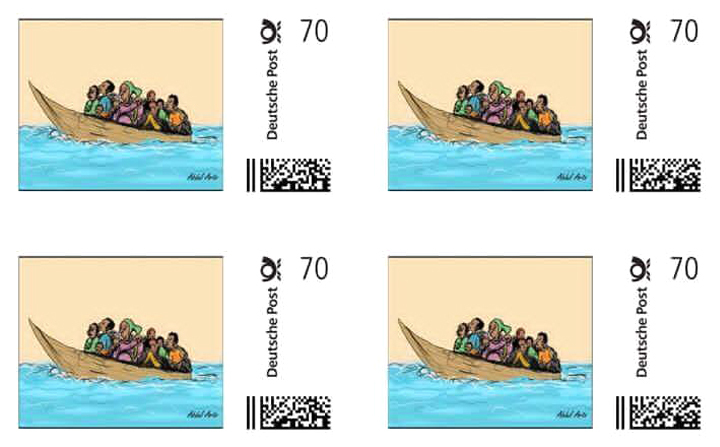 Now living in Norway, he is working to keep the plight of his fellow refugees in the public eye with the design for a German postage stamp commemorating World Refugee Day. When he left Somalia in 2008, Muhiaddin was initially granted asylum in Egypt. But even there, local associates of Al-Shabaab continued to threaten and attack him for daring to speak out. He was well aware that these were no idle threats since his brother, also a journalist and an environmental activist, had been killed by Al-Shabaab in Somalia in 2007. With the help of Cartoonists Rights Network International and the International Cities of Refuge Network, he was finally able to move to Skien, Norway in 2011. Ensure every refugee can work or learn new skills to make a positive contribution to their community. According to CRNI’s post about Muhiaddin’s stamp, he has donated the fee he received for the design to a fund for refugees. Check out CRNI Director Robert Russell’s 2013 video interview with Muhiaddin here.